Posted August 15, 2014 by Kelly McEvitt . You can’t ignore the social network any longer, Instagram is a major force in the social media world. Instagram is growing the fastest of all social media sites, increasing its active user base by 23% in the last six months (Tech Crunch). The site is built exclusively upon photo sharing, and provides a great opportunity to highlight a brand’s products, services, office life, and more. The opportunities for brand engagement on Instagram are huge. A recent study found that Instagram users are 58 times more likely to like or comment on a post than Facebook users and 120 times more likely than Twitter users (Fast Company). There is less in-your-face advertising on the platform, so users feel better about engaging with brands. At this point you should be launching a business Instagram account immediately. 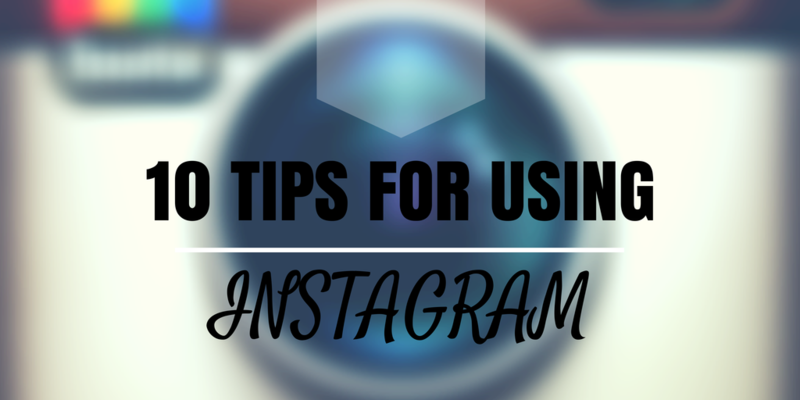 We’re here to help with these 10 tips for using Instagram. Instagram is a photo-sharing community, quickly embraced by 18-35 year olds. The network is available on iPhone and Android devices. And while Instagram is accessible via desktop, photos can only be uploaded via a mobile device. Instagram is not about ROI. Brands must understand that the site is very different from Facebook and Twitter, in that the marketing goal is usually focused simply around brand awareness. The only clickable link on your Instagram account is directly under your bio, so website clicks from your photos is not an option. The images that you share should be your message and your call to action. Think about what your target demographic would like to see. Is your brand in the automotive industry? Share pictures of vintage or remodeled cars. Once you see engagement on your images, you’ll start to understand what your followers prefer. Instagram allows for great artistic expression. Photographers use the site to highlight their work and designers use it to showcase their style. Take quality pictures and use the editing tools to your advantage. The network is not a great place to post grainy images or memes. Embrace the popular hashtags of Instagram, and use them to build a following. When #ThrowbackThursday comes around, don’t be afraid to share a silly brand photo from the ‘80s. Also, make sure that you are using hashtags for topics that are relevant to the photo you are putting out. If you’re sharing a photo of a dog, relevant hashtags could include #dog, #puppy, #austalianshepherd, etc. Have fun with your photos and videos. You want your content to standout in a follower’s feed and the best way to do that is with positive or silly content. The ALS Ice Bucket Challenge videos are a great example of fun content that you can publish for your brand. These posts keep your followers coming back for more. Everyone wants to see the person behind the curtain running the show. Use Instagram to give your followers a peak at your office. Feature an employee of the week or share pictures of a fun team event. Customers feel more loyal to a brand when they see a human aspect to the company. Don’t limit yourself to office photos or images of your products. If you’re traveling, use the opportunity to snap some pictures of your experience. There is a reason Instagram is a mobile focused social network, the site wants you to take and share pictures from wherever you are. Competing with Vine, Instagram allows users to upload 15-second videos. Mix up your content and share a video every once in a while. The average Instagram user spends 9 minutes a day on the site. Videos keep users engaged longer than photographs. Connect your Facebook and Twitter accounts to Instagram and share content across the platforms. However, use the sharing capabilities sparingly. Your followers want to see unique content on each social media network. Using relevant hashtags is another great way to get exposure for your brand and gain followers. Hashtag searches allow users to find your content and interact with your brand. Contact us for a free marketing assessment or to discuss your social media strategy. You can also connect with us on Facebook, Twitter or Instagram!